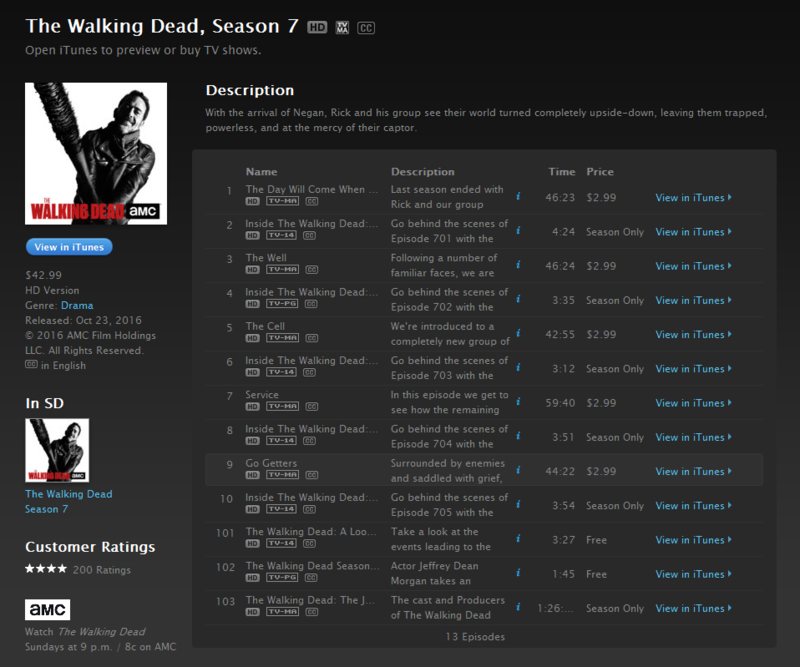 For those who sometimes purchase or rent TV show from iTunes, Apple’s Digital Rights Management projet is a big headache. Without exception, every iTunes TV show is protected by Apple’s DRM that makes it impossible for people to play iTunes TV show either purchases or rentals on other devices or players, unless the DRM protection is cracked down. Here I will show you how to remove DRM protection from iTunes TV shows with the help of a piece of iTunes TV show DRM removal software. 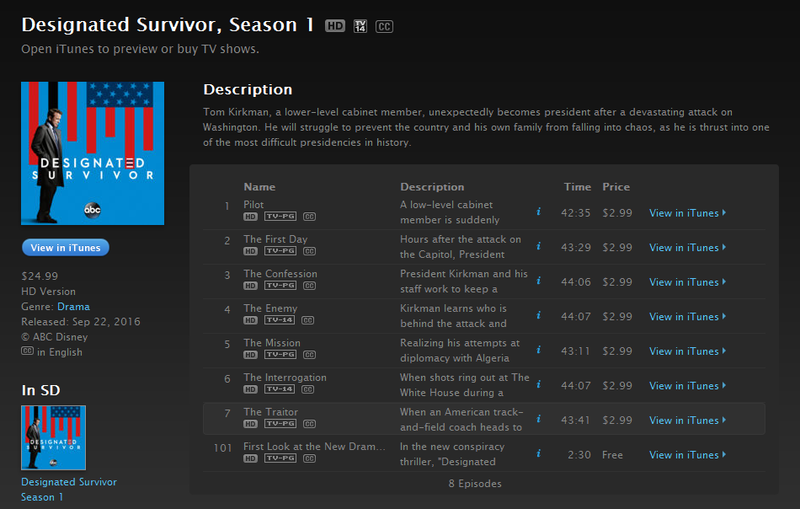 Here in Part 1, I will do some warming up exercise by introducing top 5 popular iTunes TV shows. Those iTunes TV shows are worth watching. Check them out! Released on October 23, 2016, The Walking Dead Season 7 is charged with $42.99 in HD version, together having 13 episodes. The seventh season of The Walking Dead, an American horror-drama television series on AMC, premiered on October 23, 2016, and will consist of 16 episodes that will be split into two eight-episode parts, with the second half debuting in February 2017. 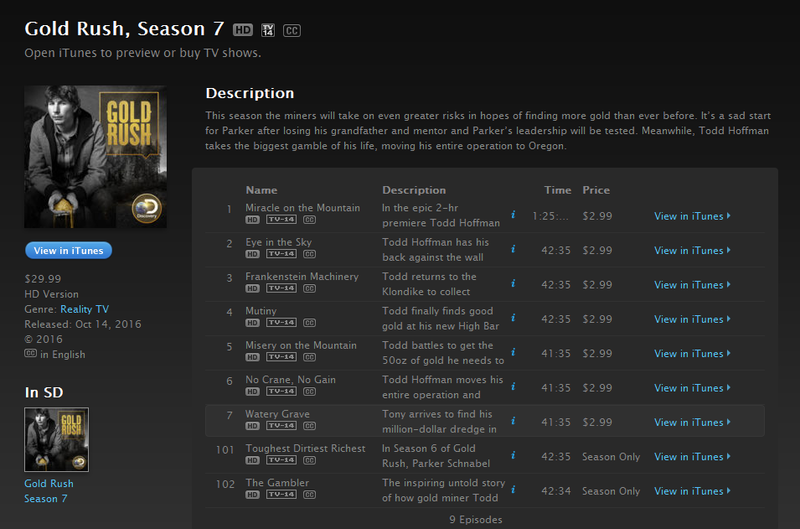 Only priced at $29.99 (HD Version), the seventh season of Gold Rush contains 9 episodes on iTunes Store. This season the miners will take on even greater risks in hopes of finding more gold than ever before. It’s a sad start for Parker after losing his grandfather and mentor and Parker’s leadership will be tested. Meanwhile, Todd Hoffman takes the biggest gamble of his life, moving his entire operation to Oregon. Released on September 22, 2016, Designated Survivor is charged $24.99 for HD Version. This TV series tells that Tom Kirkman, a lower-level cabinet member, unexpectedly becomes president after a devastating attack on Washington, and he will struggle to prevent the country and his own family from falling into chaos, as he is thrust into one of the most difficult presidencies in history. This Is Us is an American television comedy-drama series created by Dan Fogelman which premiered on NBC on September 20, 2016. The ensemble cast stars Milo Ventimiglia, Mandy Moore, Sterling K. Brown, Chrissy Metz, Justin Hartley, Susan Kelechi Watson, Chris Sullivan and Ron Cephas Jones. It is about the family lives and connections of several people who all share the same birthday and the ways in which they’re similar and different. On September 27, 2016, NBC picked up the series for a full season of 18 episodes. In 2033, the first human mission to Mars enters the planet’s atmosphere, but the Daedalus crew faces a life-threatening emergency when the ship’s landing system goes offline. The crew’s commander risks his life as Mission Control monitors from Earth. In the present day, SpaceX is attempting to land a reusable rocket to develop the critical technology that will help humans reach Mars. Using a piece of iTunes TV show DRM removal software, you can easily remove DRM from iTunes TV shows. Here I recommend Leawo TunesCopy, a professional iTunes DRM removal and a DRM media converter. The program can losslessly remove DRM from TV shows of iTunes, and then convert iTunes TV show M4V to common MP4 video. Before DRM removal process, you can freely choose audio tracks and subtitles for keeping in the output MP4 file. Multi-channel surround sounds can be preserved in the output, including Dolby 5.1 surround sound. Compared with competitors on the market, Leawo TunesCopy is 50 times faster in removing DRM protection. Download and install Leawo TunesCopy on your computer, and then follow the guide below to remove DRM protection from iTunes TV shows. After entering the main interface of TunesCopy, you can click “Add Files” button on the sub-menu bar or “Add Files” button in the middle of program interface to browse and choose iTunes TV show rental or purchase in the pop-up “Add Files” panel. Choose at least one iTunes TV show video file and click “Add” to begin importing TV shows from iTunes into TunesCopy. TunesCopy allows you to import all files at a single time by clicking “Add All” button. After importing iTunes TV shows into TunesCopy, you can choose one file and click “Remove” button to remove the file from the list. The “Clear” button on the sub-menu bar is designed for removing all files in the list at one go. Before removing DRM from iTunes TV shows, you can choose a file and click “Edit” button to freely choose audio tracks and subtitles for keeping in the output MP4 video file. 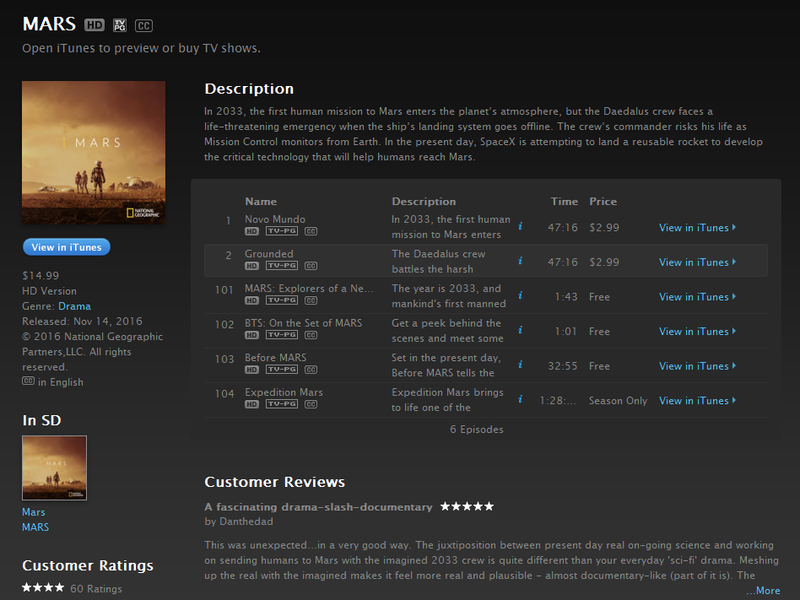 Click the blue “Convert” button at the bottom for removing DRM from iTunes TV shows and converting M4V to MP4. After a while, the iTunes DRM removal and conversion process will be completed. You have successfully removed DRM from iTunes TV shows. 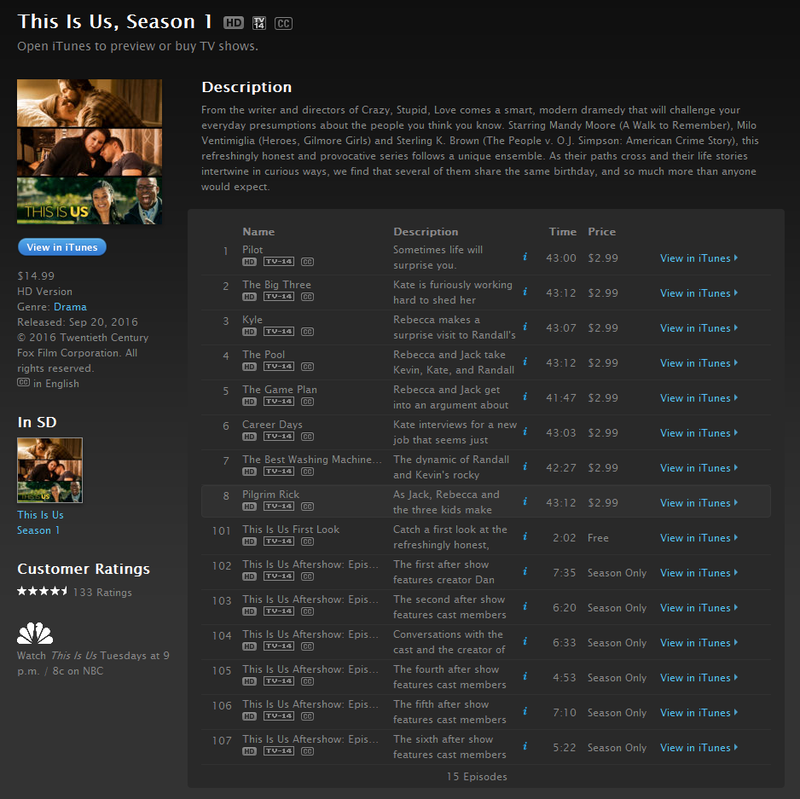 Now you can enjoy iTunes TV shows unlimitedly.